Arne, T.A. - Incidental Music in "Comus"
Arranged by Harry Wall Published by J.B. Cramer & Co. Ltd. 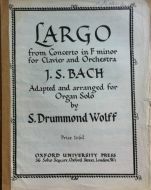 Arranged by J. Stuart Archer Published by W. Paxton & Co. Ltd. Arranged by C.S. 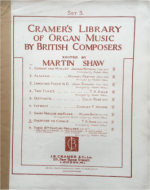 Lang Published by J.B. Cramer & Co. Ltd. Arranged by C.H. Trevor Published by Elkin & Co. Ltd. 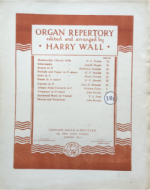 Arranged by J. Stanley Shirtcliff Published by Novello & Co. Ltd. 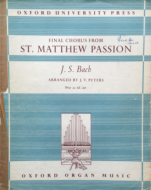 Arranged by Stainton de B. Taylor Published by Bosworth & Co. Ltd.
Chorale from Cantata 22 Arranged by Guy Weitz Published by J. & W. Chester Ltd.